Three separate news stories involving numbers this week caught my eye. iLike announced it has now has 6 million registered users and is now adding 300,000 new users a day. Apple’s Safari browser for Windows has now had 1 million downloads. Finally SpaceTime, a 3D browser we reviewed June 5 passed the 100,000 download mark. All three may not seem obviously related, but there is something they all share: large user numbers. It wasn’t that long ago that 100,000 users was considered huge for a Web 2.0 related business. Today a small startup such as SpaceTime can gain those numbers in two weeks. 6 million users three years ago would have seemed an impossible dream, and yet iLike joins a long and growing list of Web 2.0 sites with 1 million or more users. Web 2.0 offerings are improving their appeal to a broader audience which in turn is driving growth in the overall market: the Long Tail is getter fatter. Although this fattening of the Web 2.0 marketplace makes it more difficult to stand out from the crowd, the marginal cost and ROI potential has now improved. Consider the SpaceTime browser. Immediately many would question the need for an alternative browser, yet this isn’t an all or nothing proposition. Every single user of SpaceTime presents a ROI for the company due to search deals. An average SpaceTime user might return $5 per month to the company by clicking on Google ads or surfing eBay; $500,000 per month @ 100,000 users. The figure could be lower or higher, but it’s still a return. Safari will be operating on a similar model for Apple. The need to find appeal has actually decreased as a percentage of the overall market. Conversely the bar to creating a sustainable business hasn’t risen in line with the number of potential users, today startups can achieve with a smaller percentage of the overall market. 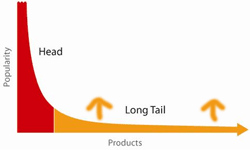 From a developers or startups view, the fattening long tail should be seen for what it is: a marketplace that has improved opportunities for smart startups. A bigger marketplace makes today and tomorrow an even better time to build a Web 2.0 business than yesterday. A fatter long tail means that as a whole there will be an increasing number of success stories and sustainable startups, a win-win all round.